Populations from the Roman and medieval remains in a relatively homogeneous group of European populations (with the exception of Finland and Latvia). The relatively large genetic distance between them and the population of Polish contemporary may reflect real differences at the genetic level, or may be the result of very small population of the Roman period and Middle Ages. The largest number of informative haplotypes from the Roman period was jointly shared with the population of contemporary Polish and Lithuania / Latvia, Sweden and Finland / Estonia. This may indicate that, in what is now Polish there is continuity of certain genetic lines, at least from the Roman period to the present, as well as close contacts of the population of the Roman period of Bałtami, Germans and Finnougryjskimi populations. The population of the Middle Ages shared the largest number of informative haplotypes shared with the population of modern Belarus, Ukraine and Bulgaria. Among the surveyed population identified haplogroup fuels such as X2, R0a or N1a, which in modern populations occur in low frequencies. Their presence in small fossil populations may be due to selection bias or a higher frequency of these haplogroups in Roman and medieval times. The populations of the Roman period and Middle Ages was the presence of four unique haplotypes, including one of the Przeworsk culture, belonging probably to podhaplogrupy N1a1a2. This means that Przeworsk culture of the Roman period, considered by some archaeologists as the cradle of the Slavs, could presumably be derived from the Corded Ware culture, which is associated haplotype tested. I also reproduce the MDS plot based on haplogroup frequencies. Note that of the two ancient populations, the "left" one is the Roman-era one, and the "right" one is from medieval times. The first dimension contrasts modern populations with LBK Neolithic inhabitants of Germany, while in the second one, there appears to be a contrast between Northeastern Europe and the rest, represented here by Germans and Balkan Slavic populations. For many years the origin of the Slavs has been the subject-matter in archaeology, anthropology, history, linguistics and recently also genetics. By now there is no unambiguous answer to a question where, when and in what way the Slavs originated. For the purposes of this dissertation, the analysis of ancient human mitochondrial DNA was applied. The ancient DNA was isolated from 72 specimens which came from graveyards from the area of current Poland. Mitochondrial DNA haplogroups have been assigned for 20 medieval and 23 Iron-Age specimens. The analysis of shared haplotypes and population genetic distances illustrated by multidimentional scaling has been done. The differences on genetic level and quite high genetic distances (FST) between medieval and Iron-Age populations as well as significant number of shared informative medieval haplotypes with Belarus, Ukraine and Bulgaria may evidence genetic discontinuity between medieval and Iron-Ages. 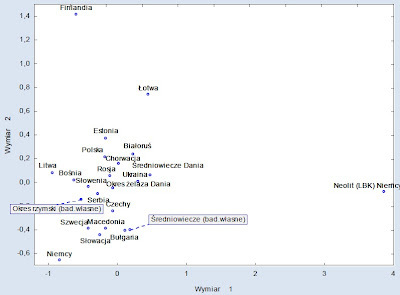 From the other side, the highest number of shared informative haplotypes between Iron-Age and extant Polish population as well as the presence of subhaplogroup N1a1a2, can confirm that some genetic lines show continuatinuity at least from Iron Age or even Neolith in the areas of modern Poland. The results obtained in this work are considered to be the first ancient contribution to building the genetic history of the Slavs. why do they refer to a "Roman" period? Poland didn't have a Roman period, anymore than Ireland did. Are they just trying to belong? Well, Poland hadnt a "Middle Age" period aswell, if you consider the collapse of Roman civilisation and the following backsilde of technology and knowledge as the start of the "Medieval Period". The Roman period nevertheless is important, because its collapse (and Hun invasions) are typically cited as reasons for Slavic expansion and westward movement of Eastern Germanic peoples. Who are those archaeologists? Seems not any one alive. Also, I find the entire premise weird. How can you find out anything about the "origin of Slavs," if you don't even understand that modern Slavs in most Slavic countries are a mixture of people who have lived there for millennia, plus a small fraction of SE Slavs who brought the language there in very recent times? This study shows that there has been continuity at least from Iron Age or even Neolith in the areas of modern Poland. It agrees with Y-DNA studies, anthropology studies, linguistics, everything. Polish population is autochthonous. It also mentions that discovery of mtDNA N1a1a2 and U4a2 shows a link between Slavic population in Poland with Corded Ware culture. It is quite reasonable now to try to associate R1a Corded Ware culture with Proto-Slavs as we know that Proto-Celto-Germanics are now linked with R1b Bell Beaker culture. Definitely links with Germans are disproved. Przeworsk and Wielbark cultures were not Germanic. It is stated there plainly. I hope all that Nazi BS will finally stop now. I've translated an important quote from the study. "The (mtDNA) haplogroup missing from both the Iron Age and medieval samples from the territory of modern Poland was haplogroup I. In contemporary Slavic populations, this haplogroup is found at levels ranging from 1.2% in Bulgarians to 4.8% in Slovaks. It was also recorded at high levels in ancient remains from Denmark. It showed a frequency of 12.5% in an Iron Age sample, and 13.8% in a medieval sample. Melchior et al. 2008 suggest that haplogroup I might have been more common in Denmark and Northern Europe during that period. Therefore, the lack of this haplogroup in ancient DNA from the territory of modern Poland, might mean that the Przeworsk and Wielbark cultures should not be identified with Germanic populations." It means that Slavs have lived there for millennia. No, it does not mean that, at all. It only means that there was continuity before Slavic language expansion. And before Slavic expansion - as we know from ancient y-DNA - there was a gradient of populations from western Germany to Eastern Poland - not some weird, imaginary, abrupt border. And in historic times, these peoples have lived together in peace in many places - so it is reasonable to assume the same happened in the past, with continuous admixture. Most people in Slavic countries largely trace back to people who lived there 2,000 to 6,000+ years ago, but did not adopt the Slavic language until ~1500 years ago. Likewise, there is no such thing as a common Slavic people or culture. Depending on where you are - almost everything changes: democratic history vs. none; Roman Catholic vs. atheist vs. orthodox; highly industrialized vs. agrarian, northern skin and hair complexion vs. southern black hair and Mediterranean skin; Scandinavian/ Baltic emphasis on fishing and raw milk vs. yogurt and feta cheese and olive oil, etc. It is also very curious that you cite Nazi BS, while promulgating a completely unscientific, nationalistic story, yourself. Do you know where the Finnish sample group is from? I wonder if it is from Lapland, because all who I know been tested at Familytreedna have matches almost exclusively only from Western Europe. I am h39. Celts( and also Germanics) are solely Bell Beakers ? The Celtic Urnfield( not exclusively celtic) and Hallstatt mainly developed from the Tumulus culture, which itself is a descendant from the Unetice culture, which is a descendant of both CW and Bell Beaker Cultures( mostly in metalworking). Yes it is clear that Przeworsk is not the Jastorf culture( Jastorf really is an oddball), but it developed from the Pomeranian Face Urn Culture, of course with other influences. The oldest Face urns actually are from Northern Denmark and southern Scandinavia( the Stone Cist they were placed in probably too). Of course a Scandinavian homeland has been debunked for a lot of tribes( but not for all), but the contact between Scandinavia and the Southwestern coast of the Baltic had been pretty strong since the early Bronze Age. Tacitus places Germanic tribes between Odra and Vistula, including the Vandals, and even wrote that the area would belong to Suebia. And if you start to work with Hydronyms( and other Toponyms), you will either come to the conclusion that the inhabitants were either speaking a) a very archaic Germanic language or b) a language closer to Germanic than to any other known IE language. There were no Germanic tribes in Poland. There are no Germanic hydronyms or toponyms in Poland. Wisła, Odra, Warta and other rivers are beyond any doubt Slavic. It was proved by prof. Gołąb and many others linguists. They don’t only have Slavic etymology but rivers with similar names are all over other Slavic countries. There is now little doubt that population there was Slavic and not Germanic. Genetics, anthropology, linguistics, archeology, everything supports this. *hwistaz which means white , the suffix -ula seems to be a diminuitive. Take a look were most Balto-Slavic hydronyms are: east of the Vistula. Most modern Polish archaeologist disagree with you assertion that Slavs originated in the Przeworsk Culture. The burial rites of the Face Urn Culture clearly come from Scandinavia. During the migration age the area of the Przeworsk Culture was largely abandoned. Do you know that the Przeworsk Culture extended into modern Hesse? BTW Tacitus seems to have differentiated between different Languages? And that the land of the Lugiones belonged to Suebia according to him? And he doubted that the Vistulaic Veneti ( who lived east of the Vistula) were real Germanic people. Yeah I should stop BS. I agree in many parts with Sturisoma, except that Jastorf is anything but an oddball. The area represents one of the clearest examples of northern (originally, proto-) Germanic continuation from Mesolithic to bronze age and to iron age and the present, and the region coincides (including adjacent areas to the east) with much of what most modern European linguist identify as one of the main centers of origin of Germanic languages. I did not mean that Jastorf was an oddball in the sense of being of Germanic origin, but in the sense of social stratification. BTW I gave you a nice etymology for the Vistula. And the last time I looked at a map, the Vistula mostly lies west of the Carparthians( and I hope you do not mean the ﻿Poieneşti-Lukaševka Culture). If you would read further literature, you would see the whole burial rite of the Face-Urn Culture comes from Scandinavia, Kristiansen work may be a nice work, but it is just one opinion. Later Przeworsk elements show the same pattern. And atleast Tacitus seems to use Germanic as an ethno-linguistic term(or he atleast diffentiates between different languages), look what he writes about Peucini and Aesti. He also attest several Germanic tribes that turn up later in Roman history east of the Odra. And it is funny that you use the term "Venetic" in a linguistic sense, the use of it besides for proper Venetic has fallen out of favor. BTW are you Hxseek/ Slovenski Volk? If the Slavs had learned these river names from GErmanic speakers, then would they not show signs of sound shift and Verner's law ? None do. Germanic started to deviate from the larger regional IE at or (IMO) earlier than 1,500 BCE. Grimm's law's dating is highly controversial, from ~1,200 BCE to a completely weltfremd century or so BCE. Dating of Verner's law is less clear, but even if it is slightly older than the first Grimm's law (likely), it is too late to affect namings of rivers etc. Toponyms evolve a bit but most commonly don't change with a series of drastic language changes, especially if the latter are so significant that a lay person without effort may no longer recognize the meaning after just a couple of handfuls of generations. So, you expect toponyms to predate the language of local populations by many, many centuries, if not several millennia. In other words, the local people living there first spoke a regional IE that slowly turned into a proto-Germanic, at which point toponyms froze in. But the people's language continued to develop into a full-fledged proto-Germanic and later regional (East-) Germanic. Another linguistic argument can be made from very, very early Germanic loan words into Uralic, while the vast majority of Slavic loan words into German are extremely recent. That is, (proto-) Germanic tribes in what is now Poland and beyond largely bordered Uralic ones - not Slavic tribes. Conversely, the (proto-) Germanic tribes on the Southern side of this region that were close to Slavic-speaking people had zero impact on the further development of Germanic languages, because they largely adopted Slavic languages later, instead. Yeah - but in conjunction with an extremely long and steady archaeological (and y-DNA) continuity that (lack of) social stratification can be used as a strong argument that (proto-) Germanic is autochthonous to that exact area. Dr. Rob, if you do not think that that Poland was heavily influenced by Scandinavia, I would advise you to read more literature. Fibulae are not the only connection. As I already said, look at the whole burial rite for example. Also, I never advocated big Migrations, especially from Scandinavia, and before the Migration Period, as true, Just that there were a lot of cultural borrowings. This has been the case even before the arrival of IE people. And do you agree that the Face Urn Culture was at least partially the Ancestor of Przeworsk? Concerning Tacitus, he was no modern ethnologist, but he based a lot of his writing on Pliny the Elders Bella Germaniae. Pliny actually served in Germania, and I think he would at least know what Germanic people have for a language. The Romans actually had interaction with them, and at least send some people to the Lugiones. We have finds of the Elder Futhark from the Przeworsk culture. BTW where do you think the population of Przeworsk has gone during the Migration Period? do you atleast accept that Hydronyms tend to be consevative? And do not forget about sound substitutions. If you would have to use Occam´s Razor, what language would you assigh to the Przeworsk culture? Germanic(Including archaic forms), Slavic, Baltic, or an undiscovered IE language? And I ask you once again, are you Hxseek? What is this discussion all about? Discussing that fascinating results at the level of population genetics, shouldn’t one know the number of medieval samples analyzed and the details of procedure applied? Neither the number, probably playing a key role in calculation of the results, nor the methods applied, crucial in the ancient DNA studies, are known! Moreover, how is it possible that one individual with N1a1a2 (if correctly identified) can serve to judge the relationship between cultures (Przeworsk from Corded Ware Cultures?)? What would the Author say in case she found hg Z among the studied samples? What sort of continuity would it suggest?